All Out Effort Blog: Are You Running Low On Fats? For thousands of years, people ate saturates fats. Several decades ago, due to rise in heart disease, it was decided that saturated fats were bad, in it's place came an increase in refined carbohydrates (sugars), low-fat, low-calorie processed foods, and man-made fats such as trans-fats and polyunsaturated fats. This also increased monocultures and GMO crops to meet the rising demands of a low-fat culture. Animal protein was replaced with man made protein products, using mostly corn, soy, and wheat. Like many things with health, when it sounds too simple, it may be missing the bigger picture. Removing animal fats and saturated fats sounded like a simple easy fix yet it made obesity, diabetes, and heart disease worse. Health and science is complex and the more we study, the more complex it becomes. Intuitively many in the science world felt that the saturated fat hypothesis was overly simplistic and now after several decades, our views on fats have shifted back to the way it's been for thousands of years. Like views about genetics, we thought many diseases were related to environment and heredity, then for decades people who had an overly simplistic view of genes thought genes explained everything, diseases were preordained. Now that we understand more about genetics, we know it is still about environment and heredity. 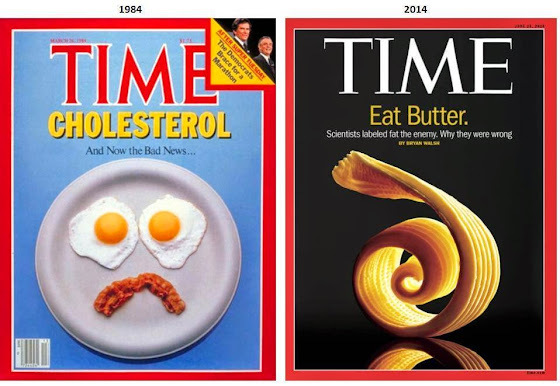 Time magazine along with nearly every other media outlet published stories that it's time to end the war on fats. That the USDA guidelines about saturated fat intake was wrong. Fat is an essential nutrient and without healthy fats as a form of fuel, we turn to and crave sugar. That is the direct relationship that has harmed our health for the past few decades. Dry skin - Sebum is a natural oil our body produces to moisturize the skin. Our bodies produce it with available fatty acids. Low carb is not working - There is a direct relationship with too much carbohydrates and weight gain. The problem is people still fear fats, and go low-fat while eliminating carbs. This is a recipe for disaster as you'll never feel full, not get enough nutrients and fuel, it will not be sustainable, and ultimately lead to sickness. If carbs go down, fats must go up. Those are the two fuel sources our body and brain relies on most, reducing both gives us no fuel. For people who don't like vegetables, fats also work as a great accompaniment whether your cooking with it or drizzling it on. Fats does not have to make people eat less vegetables, in fact fats can help people eat more vegetables. Never full - Saturated fats help us to feel full, while certain monounsaturated fats like olive oil, avocados, and nuts also help with satiety. It's "heavy" without the downside of sugar. Low physical performance - Without fats, we don't physically recover properly and our hormones (testosterone, estrogen, cortisol) get out of balance. Joints ache - Healthy fats not only helps reduce inflammation in joints, but it also helps with joint and wound repair. Low HDL - Healthy fats increases the good cholesterol (HDL), while man-made fats like polyunsaturated fats and trans-fats lower HDL. Low mental performance - Healthy fats increase brain function, especially medium chain triglycerides (MCT). A high-fat doesn't hinder the brain's access to glucose as fuel, it increases it. Weak liver - Saturated fats can reduce liver toxicity and injury, along with medium chain fats such as MCT and coconut oil. Man-made fats like corn, soy, and vegetable oils can damage the liver along with ingestion of too many carbohydrates. In the early 1980s, the lipid hypothesis came to the forefront of public medicine. Based on research done by Ancel Keys, saturated fat and cholesterol were implicated as the leading cause of cardiovascular disease. Years since then doctors and researchers have realized the two are correlated but no direct cause and effect. Cholesterol was the smoke, but not the fire. Inflammation caused by sugar, stress, and man-made fats was the fire. Our liver produces cholesterol to repair damage. Now scientists are seeing the other side of saturated fats, the health benefits such as weight loss, mental health, and it's benefits in fighting Alzheimer's disease. In fact there is no significant evidence of saturated fats being associated with increase heart disease or coronary disease. MCT oil and butter are brain food, much like fats from fish, olive oil, and nuts. A known thermogenic, a popular oil among ketogenic dieters, and a key in the treatment of epilepsy and other neurological disorders. It's been used at the world famous Johns Hopkins for years. It's a type of fat that is not only used quickly as energy, but it makes your body want to burn more fat as fuel. Studies have shown it also increases cognitive abilities. Our brain is made up of mostly fat, particularly the myelin and our brain not only uses glucose but also ketones and medium chain fats as fuel. Fat moves better through fat, better than glucose. How much energy our brain uses is still unknown, the general consensus is it uses a lot, and the more you demand of your brain, the more energy it uses. This is partially why stress increases cravings, sugar makes it worse and fats make it better. The main form of fat in coconut oil is MCT, which is why coconut oil is so popular. It boosts immunity, metabolism, thyroid performance, and heart health as well. It gives you quick energy like carbs, it's longer lasting, doesn't get stored as fat, and doesn't give you a crash. This begins to change the structure of your energy system, how your body uses energy, and the type of energy it prefers. I add the NOW MCT oil to many things, like tea, coffee, I drizzle it on foods, and sometimes I take a spoonful (as opposed to the spoonfuls of sugar kids were fed to make bad tasting things go down). Grassfed butter has three to five times more CLA (conjugated linoleic acid), and has none of the inflammatory issues. It has almost no casein or lactose, and has only the good properties of dairy. It aids in muscle development, immunity boost, fat loss, has lots of vitamins, especially A and K2, and an abundance of healthy fats. It may be just as important or more important than MCT oil for the brain. It has arichidonic acid which helps with brain function, but also the short chain fats of butter is great for long term energy and is a reason why it has been key to the survival of people who live in altitude such as Tibet (Himalayas), along with nomadic tribes, and tribes in cold climates and hot climates. Fat was a principle player in long sustained energy for most early people. They traveled or climbed long distances on just fat. People run marathons loaded up on all kinds of sugars, whereas native tribes ran or trekked even further on some dried meats, nuts, and fats. Now low carb runners are setting records. Butter alone has played a big role in the diets of many Eastern and Western cultures. There are so many documented health benefits of butter. There are no natural vegan cultures, they at least ate butter. Butter is my go to cooking fat, it's also now common place to put it in your coffee. The most reliable brand I find is Kerrygold Pure Unsalted Irish Butter. You can't increase fats without increasing protein; and in combination, the health benefits are tremendous. This is especially true for breakfast, which can increase alertness, mood, and weight loss. The only supplement I recommend to to everyone are fish oils. Fish oils are naturally one of the most effective at reducing inflammation, they're also rich in nutrients. Inflammation is a factor in nearly every disease, including cancer and reducing inflammation then must be a priority. Not all omega 3 supplements are the same; fish oil is superior to krill, flax, chia, and every other form of omega 3. This doesn't mean you should buy any brand of fish oil, as they too are not all created equal, which is why many of them are a waste of money. The brand I recommend are called Nordic Naturals in the triglyceride form (triglyceride form is what makes it bioavailable). I take two every morning, but take more if I know I'm going to have an intense workout that day or if I'm feeling some extra stress. I couple this with Vitamin D3 from Nutrigold. D3 is the most natural and absorbable form of vitamin D. America ranks highest in vitamin D deficiency, and vitamin D plays a role in nearly every health function.